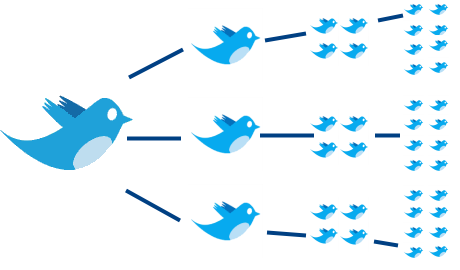 Retweet is a function that a twitter user does to post the same tweet of others which is worth sharing with your followers, including the profile credit to the original tweep. Retweeting not only helps in sharing news pretty easily from-and-within twitter, but also in getting into conversations and finding new people to follow through the retweets. Retweeting is one of the viral marketing tricks right now on twitter, where the links promoted and shared by people with huge follower base, gets retweeted by many people and those are again retweeted by others, spreading the link virally all around twitter. But nothing on the web can be saved from spam, and spammers have become so smart to retweet the links and tweets of high-profile members just by changing the link! Most of us don’t notice this, as we see the name of some good user in the tweet and we run to read what it is. It may be a computer virus too. So you have to take good measures to see whom to retweet, why to retweet them, and is the user trustworthy? Whom to retweet? Recommended people! Retweeting helps not only in getting noticed by other people whom you were following and retweeting, and if they were not following you, they might from now, because of the trust they get on you. It helps in networking, with new people and also you can build the number of retweets within a group of people whom you always retweet and they do the same. Self-benefit: You can sometimes share your links that are worth sharing, and they can get retweeted when you are always in the scene of retweets. Your chances of getting marked as a spammer gets decreased. One of the ways to show twitter that you are original, not a bot! A way of thanksgiving: For someone helping you out, retweeting their links and tweets is a good way to thank them! They get a feeling of getting noticed more on twitter. Hashtags – Try to use 1-2 most relevant hashtags in the tweet, so that many users who search twitter through hashtag in searches, can easily discover that tweet although they might not be following you, and by this you can get more retweets, and sometimes followers too! Tweet stuff that everyone loves to read – You have followers of all minds, not just related to one niche. So keep that in mind before you post any tweet and expect that to be retweeted. Keep most of the tweets and links that are general and liked to share by everyone. Original stuff – Write something original, and kind of stuff that can be well appreciated when read, and is useful for many. Just writing some news that is already spread on the web, and expecting that to be retweeted is waste of time. Be original. Trusted sources – When tweeting links like Techcrunch, mashable, or some good known site, you will be more easily retweeted as those are some trusted sources whose news is always loved to read and share by anyone. So, while sharing news from those sites, just add their name in the tweet like “Techcrunch: Followed by the matter” etc. Time zone – This is sometimes a really important factor, as depending on the place you are from, the followers can be judged. Being an Indian, i have many Indian followers who usually retweet my tweets and if i tweet some good retweetable stuff at mid-night when everyone’s asleep, there’s no spread of that. So some research on people who retweet your tweets is also important for this. 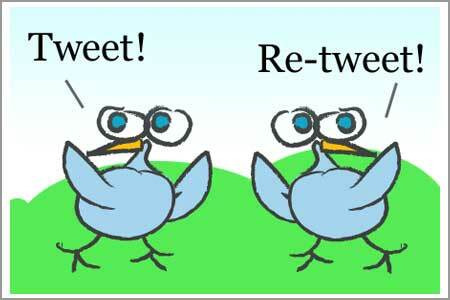 Retweet others – Even the best twitter users also retweet a few people’s tweets. That is where they get the benefit of getting retweeted by others. Don’t always think that you would be always retweeted without doing anything for others. Target the headlines – If possible, use something like “For bloggers” or “For designers” for links that are directed towards them, so that many people in the same niche can retweet the topic. Keep the tweet short enough so that someone else can retweet it. If you fill the whole 140 characters, and leave no space behind, the one who wishes to retweet it would not do it. Check the link before retweeting – Sometimes a few links lead to malware sites, which automatically downloads viruses to your computers. So do keep checking the links before retweeting. Don’t always tweet links and expect them to be retweeted. Tweet some quotes or thoughts and they too will be well circulated around. Use sites like Hashtags.org, Tweetmeme, Twitturly, Monitter, Twithority to track the most done retweets. @ChrisPirillo – Tech blogger with good tech related links and blog posts being shared by him. @Mashable – Social media, and tech related tweets. Most of them twitter related. @Lifehacker – Tech tips and tricks. @Techmeme – Tweets all the latest tech trending news. @Cheth – Design and blogging related tweets, links shared by him. @Rmilana – Many random things, links, weird characters and quotes! All worth retweeting. @AmitBhawani – Technology related news and tech tips. @labnol – Technology related hacks and news. @Tweetmeme – Retweeting all the best tweeted and retweeted tweets! @smashingmag – Best for designers. @guykawasaki – A great well known tweep to follow and read the tweets. @Minervity – Web design and tech related tweets worth retweeting. @retweetradar – Another retweet tracker. @mistygirlph – Web design, blogging related tweets. @problogger – All about blogging, the best blogging tips and news. @cnnbrk – All the breaking news. @twitter – Some important twitter related news and updates. @ndtv – Indian news instantly on twitter. @google – All google related news and tips. @MacRumorsRSS – Mac, Apple related tweets. Thanks to @rmilana for the idea of the post! great content, a must RT post. Wow! i like the way you wrote it out! thank you for the reco! you rocks! Hey earlier i used to retweet a lot but never was worthily but now it is possible to follow these tips and will be really helpful for me.